When searching for the best way to cook something, would you ever really want to look for the appliance that is most mediocre? If you are like us, you are never looking for an average way to cook average tasting food. Anytime that you make or reheat something, you want it to taste great and so do we. One of the easiest, best, and most convenient methods that you can use to cook food at home is a toaster oven. If you have never used one before, you are about to open your eyes to a whole new world of easier cooking. 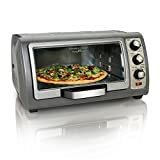 Basically, all you have to do is insert whatever food you are reheating or baking, make sure your oven is on the right setting, select the time that you want to cook for, and in a few minutes you can have anything from a delicious pizza to a perfectly toasted bagel. If you need an appliance just to toast bread, English muffin, crumpet, or halved bagel, a toaster can do a good job. However, if you need a small appliance to toast, bake small dishes or reheat your foods without advanced features, you can get a good toaster oven under for less than $100. However, if you are looking for a toaster oven that can do more than just basic cooking functions or have more advanced technology to control heat for better results, let’s check out our best toaster oven review and best convection oven reviews. Now we are going to tell you what are some of the most important features that you need to consider when shopping for the right toaster oven? Whether you want a convection or conduction toaster oven, is one of the most important decisions that you can make. Where conduction ovens only cook your food heating from one or two sources (top of the oven, bottom, or both), convection heats your oven uses a blower or fan to circulate hot air evenly from every corner of the oven. This makes for a faster and more even cook or bake on anything that you are preparing in your oven. Most convection ovens will cost a little more but cook food faster. See more on Convection Oven vs Conventional Oven. What can you cook in a toaster oven? The answer is you can bake desserts, snacks, frozen foods or even dinners. Therefore, the next thing that you want to take a look at are the functions that your toaster oven offers. Do you usually bake, broil, toast, etc. What are you going to be cooking or heating the majority of time in your toaster oven? If you are simply looking for the ability to toast bread or bagels for breakfast or a snack, you may be happy with just about any reliable, standard toaster oven. If you want to bake a large pizza or cook on a rotisserie, you are going to need a bigger oven with more features. Some ovens have an automatic shutoff when your cooking timer is up, and other models don’t. If you know that you are going to be multitasking and in and out of your kitchen frequently while you are cooking, you may need an automatic shutoff timer. If you are typically in the kitchen the entire time that you are cooking, this automatic function may not be as high of a priority for you. Now that you have a better idea of some of the features that you may want to look for, let’s take a look at some awesome toaster ovens. 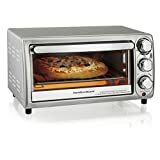 This Hamilton Beach toaster oven has everything that you could possibly need in a single toaster oven in one compact and convenient housing. 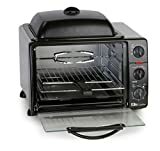 It has a four slice capacity for bread and it has a handy bagel toasting setting that will perfectly toast the sides of your bagel that is cut open, while warming the exterior of the bagel for perfect texture, temperature, and flavor. If you are a fan of pizza, you are just in luck. This toaster oven can easily cook an entire 9 inch pizza to perfection. It has an easy to use, three knob control that allows you to select the setting that you want to use, the temperature of the oven, and the amount of time that you want to cook for. This oven has a 30 minute cooking timer with an automatic shutoff feature, so that you don’t have to worry about burning or overcooking your food. It has two different rack positions, and the racks are totally interchangeable and removable, so it is really easy to clean your oven. ✘ This model is not insulated, so it gets really hot to the touch. Read a full review of Hamilton Beach 31143 Toaster Oven. As far as consumer products go, Hamilton Beach is one of the best brands out there as they make all kinds of high-quality machines that make your life easier. In this case, the mini toaster oven Toastation provides you with excellent results in record time. If you love to make things like breakfast sandwiches, then this is a great model for you. What sets this model apart from the others is that it has a traditional toaster on top and an oven on the bottom. That means that you can cook eggs or meat in the oven while you toast bread. Unfortunately, you cannot do them simultaneously, but it should cook relatively fast so that your toast doesn’t cool down too much before your meat or eggs are ready. One thing we like about this unit is that the toaster comes with wide slots so that you can put bread or bagels inside without overstuffing it. Also, the bottom holds up to two bread slices, making it ideal for single-serving meals. Other features include six toasting settings, automatic shutoff for safety, and a baking pan for easier cooking. The digital controls allow you to pinpoint the temperature accurately to make sure your food comes out correctly. The buttons are easy to press, and includes settings for time, temperature, and functions. You can choose from bake, broil, toast, bagel, pizza, and other choices for your favorite food. The convection oven contains a fan that circulates the hot air around the food to cook it evenly. It works quickly, even when it’s on the baking setting. The two rack positions allow you to make enough room to fit more food inside the oven. It’s ideal for those wanting a convection to make large enough meals. The toaster is compact enough to fit on a countertop, but has plenty of space for holding your favorite food. It can hold up to 12-inch pizzas, and six slices of bread for toasting. The inside of the oven is curved, allowing you fit more food inside it than other convection ovens. The 120-minute digital timer allows you to set the time precisely and accurately. You can set it for toasting, broiling, and baking. When the timer runs out, the oven turns off automatically. You won’t need to spend more time watching the timer to make sure your food isn’t overcooked with the accurate timer and heat settings. 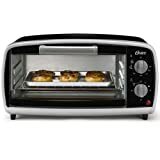 Let’s now take a look at the Oster 4 slice toaster oven to see what it has to offer. It has an easy to use, two knob control center that allows you to select your temperature and cook time. The oven’s heat settings allow it to go up a whopping 450 degrees fahrenheit, so you can virtually cook anything that you want to. This oven has a timer that goes to a max of 30 minutes.. It has removable crumb tray and two different rack positions that give you more versatility with how to cook and bake. We also really like the look and the design of this toaster. It is combination of stainless steel and black coating so that it can easily mold into the scenery of your kitchen. This convection toaster oven is designed with a curved glass door to make it easy to see food inside the oven as it cooks. You can easily grab your toast, snacks, and meals when they are ready just open the the large door. The Hamilton Beach 31126 Easy Reach Convection Oven comes with four settings so you can choose to toast, bake, broil, and convection cooking. The top dial allows you to select a temperature ranging from 150°F to 450°F. Like other convection ovens, this oven has a top and bottom heating element to generate heat and then a a built-in fan distributes heat around your food, making the food cooked fast and evenly. With the four settings, you can choose between traditional baking which is ideal for soft baked goods and convection baking which is ideal for a crispy pizzas and cookies. The oven is also very easy to clean. Thanks to its doors designed to be opened above the oven. Food can’t spill on the door. Also, all of the melted cheeses, crumbs and other items will fall right onto the tray underneath. All you have to do is to remove the tray and wash it with hot soapy water. This is another cool and unique model from Oster in a few different ways. First and foremost, this oven comes with a dedicated pizza drawer, that is perfectly designed to cook pizza only. Plus, it has your standard toaster oven that you can use to cook anything you can imagine. This oven is also designed with convection technology for faster and more energy efficient baking. It has a simple 3 knob design, and the custom settings on the oven include bake, broil, toast, and keep warm. 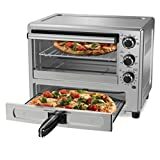 We would highly recommend this drawer for pizza fans and toaster oven fans,because it can cook an entire 12 inch pizza at one time. This oven also has a 60 minute timer with an automatic shutoff feature so that you never overcook your food. This massive 6-slice toaster oven from MaxiMatic offers many cool and convenient features that you may enjoy. We like that this oven is the one stop shop of toaster ovens. It has settings so that you can bake, broil, toast, steam, and rotiss meat as well. More space is added to the oven because it has a dome lid that sits on top of it, so that you can use the rotisserie to cook a sizable turkey, roast, chicken, etc. It has a 23 liter capacity, so it is perfect for cooking large meals for the entire family. This large oven has a six slice capacity, unlike the standard four slice toaster ovens. In all, this oven has three different adjustment knobs that control time, temperature, and allow you to use eight different custom settings. ✓ 8 different settings for customizing your cooking from baking and broiling to keep warm, rotisserie, and toast. One of the biggest problems with most toaster ovens is that if you want to cook something besides toast at the same time as your bread, you are out of luck. Most units only have single settings, meaning that you have to cook the toast first and then put other foods in like eggs or meat. Fortunately, the TEMPR100 from West Bend solves that problem by having a side heater so that you can make a breakfast sandwich in record time. First of all, this model comes with four extra-wide toaster slots so that you can get your bread cooked to perfection. Additionally, there is a poaching station on the side that uses steam to either cook eggs or meat or both at the same time. This model comes with four different accessories so that you can mix and match according to your needs. Overall, if you like making egg sandwiches in the morning, this is the perfect machine for you. At the end of the day, one of these reliable and convenient toaster ovens has to come out on top. Which one do you like best and why do you like it? After taking a careful analysis of each of these models, we actually thought that the best of the toasters was the last one. The MaxiMatic is the biggest and seemingly most versatile of all of the toaster ovens that we have looked at today. Even though it cooks by conduction and not convection, we really love the size and all of the features that this wonderful toaster oven has to offer. If you have the space and have been looking for a better way to cook and reheat food, we would recommend this one.